Though the giant kites won’t be flying until El día de los difuntos (Day of the Dead) on November 1, we’ll be seeing much smaller versions for sale throughout the month; also, there will be kite-making classes and excursion opportunities (make your plans early) on the Day of the Dead to Santiago Sacatepéquez to watch the kites as they soar heavenward. 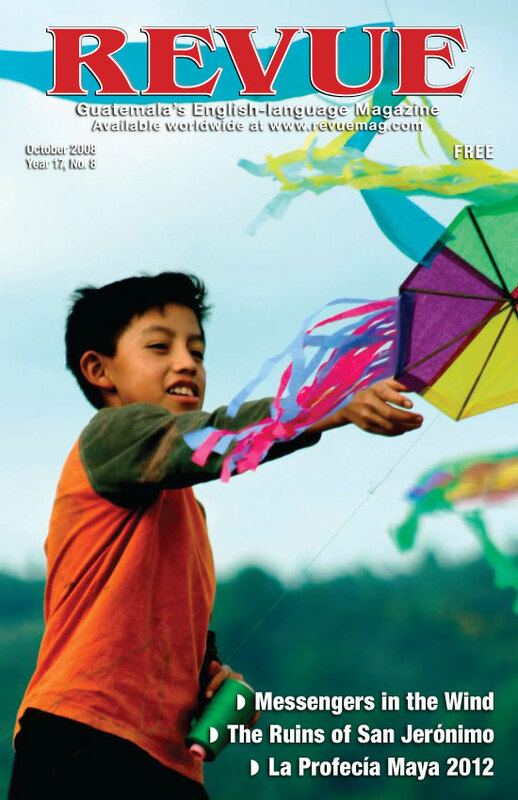 Thank you to Iván Castro for his magnificent photo gracing this month’s cover and his shots that accompany Messengers in the Wind, The history of kite making in Santiago Sacatepéquez. Party with a Purpose celebrates the conclusion of the Panchoy 50’s first phase: completing the formation and analysis of 10 volunteer committees that focused on an integral, 50-year development plan for the Panchoy Valley. Humble Beginnings is the story of the Ruins of San Jerónimo. Once a school, a chapel, then in 1766 it was transformed into the Royal Customs House. The site was abandoned in 1773 when the town was destroyed (again) by a massive earthquake that ultimately resulted in moving the Spanish capital to what is now Guatemala City. But before the Spanish, the Maya ruled the region. Time, Imagination, and La Profecía Maya 2012 recaps a conference, attended by more than 1,200 people, that explored the link between the Mayan ball game, the creation myth found in the “Popo Vuh,” carvings from a site at Izapa and the galactic alignment set to occur on December 21, 2012, ending the 5,125-year Mayan Long Count calendar. Dr. Karmen brings us The Art of Listening, and in a new column, ‘Lake Views’, Dwight Wayne Coop has a lot to say about Birthday Parties. As we’re approaching the end of another year, it is time to think about Avoiding vs Evading, offering a few tips on U.S. taxpaying and IRA accounts. 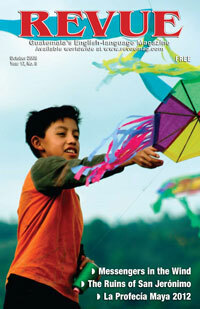 El Salvador is gearing up its Regional Cuisine and some local photographers unveil a lovely El Salvador pictorial.